In a mixing bowl beat with the whisk the eggs and the olive oil for 2 minutes. - add the sugar and keep beating for 2 more minutes. - add the flour and the baking powder little at the time while mixing at low speed. -grind the pistachios in a food processor until is a coarse powder. - add the pistachios to the mixing bowl and mix for 1 minute at higher speed. prepare a 12x10x2.5 backing pan with a sheet of backing paper oiled with some of the olive oil. transfer the mixture into the backing pan and level it well. put it into the oven at 350F for 35 minutes. when cooked it should have a light hazelnut color. Don’t worry if it looks a little undercooked in the center. Once cold it will have the right consistency. set aside to cool for a couple of hours. In a small saucepan put the lemon juice and the sugar. mix well and cook at low flame until boiling. Mix the corn starch with a tbsp of water so that it dissolves into a liquid and add it to the lemon and sugar juice. boil for 1 minute. transfer into a container. set aside. When the cake is cold enough to be cut, slice it into two half lengthwise, like a sandwich. wet both the inside surfaces with the Limoncello and top one of them with the curd. close back the cake with the other half. let it soak for 1/2 hour and serve it with a dust of powder sugar and a scoop of vanilla ice cream. In Florence, there are stores called “Civaioli” that are dedicated to selling only beans or other legumes. The quality of garbanzo and cannellini beans is a real sense of pride for marketplace shop owners, who by lunch time have them ready to buy and bring home. While they may often go unnoticed, there are huge differences between dried beans, even of the same species. The next time you are in the market, a good way to decipher the quality of the bean is the origin and freshness of the bean. Beans from Italy are typically of higher quality. There are several D.O.Ps in Italy for beans, which means they are held to very strict quality standards by the Italian government. If you’re lucky, you can get your hands on some of these. This recipe is valid for both cannellini and Garbanzo beans. Just cook the chickpeas 1 hour longer. Rinse the sage, tomato and chick peas in fresh water. Slice off the head of the garlic, but keep it whole. Combine all of the ingredients in a large pot, including the cold water. Everything will be whole at this stage - whole garlic, whole sage, whole tomato - everything. Bring the water to boil and then lower the temperature until the water looks as if it’s barely boiling. Allowing the dish to cook at a low boil prevents the chick peas from peeling. Both the chick peas and cannellini beans cook for about two hours or until soft. Use a perforated spoon to serve the beans so that the rest can stay in the flavorful water. *Lowering temp of boiling used to be achieved by cooking “al fiasco’. People used to combine all the ingredients inside a glass flask and nestle it within the warm ashes of a fireplace. They would leave it overnight to cook and by morning the beans were cooked perfectly and breakfast was ready. This past Monday a few of us from Locanda took a little jaunt up to the Hudson Valley Foie Gras Farm. One of our long-time purveyors, D'Artagnan, extended us the invitation to see the farm and witness their process first hand, and to their delicious ducks and foie gras. Since foie gras isn't Tuscan you won't find it on the menu at Locanda, though we do receive our duck from D'Artagnan. However, we ate, drank, and learned a whole lot about foie gras that would be criminal not to share. During our visit we were shown the nursery, growing area, gavage, and processing areas. My favorite part, naturally, was the nursery, which largely surpassed my threshold for cuteness. Each week, 5,000 male ducks are placed in to the 90 degree nursery where they stay for four weeks. We got to hold them for a few minutes. I had never felt so warm and fuzzy. Those things that looks like little heaps of pollen are actually little ducklings. So cute! Marion and I holding five-day old chicks. Such sweet little things. Contrary to the picture, they are actually quite difficult to hold. Those wings flap with a vengeance. Even still, totally heavenly. Chatting, napping, and growing up. After 12 to 13 weeks, the fully grown ducks are moved to the finishing stage of gavage. Finding food in nature is often difficult for ducks due to a number of factors like varying weather conditions and inter-species competition. Therefore, ducks have evolved to be able to fill up whenever they find an abundant source of food. At Hudson Valley Farm, they never feed the ducks more than they have been observed to eat voluntarily. During the gavage process, ducks are fed a proprietary mix of grains (reflective of a natural diet) with a high protein level. As the ducks are fed, their food is dropped (by gravity, not pressure) via funnel into the area at the base of their neck called a crop. This is the best method for delivering a precise amount of food into their natural food storage area. Before the feed, however, the feeder feels the esophagus of the duck. If there is feed left from the previous meal, the feeder skips the duck. After gavage the ducks are sent to processing. While never a pleasant topic to divulge on, as far as we could observe, the ducks are treated as humanely as possible. Upon entering the processing area, they are placed on a line and stunned so that they do not feel the cut for exsanguination. Some of that delicious foie gras! Relaxing after the fact. Embracing our last chance at a summer sunburn. He knows what he wants and does not mince words. Our wine dinner last week was a smashing success. We were able to pair a menu of sustainably-raised fish from our new friends at Sea To Table with the distinguished wines of the Famiglia Olivini vineyard in Lombardia. Sea To Table is a family-owned seafood distributor located in Brooklyn. Started by Michael and Sean Dimin in 2006, Sea To Table is committed to building relationships with responsible, small-scale fisheries and connecting them with thriving markets in as little as a few hours. The menu for tonight, crafted by Chef Baldacci, will features only fresh fish from Sea To Table docks in Martha’s Vineyard, Cape Cod, and southeastern Maine. Every so often, a location scouts deems Gates Avenue a worthy spot to set up shop. The classic 'Brooklyn charm' and wide array of available seating with which to support the crew make us the ideal landing spot. Sit away, my friends, sit away. Just keep me away from craft services. It's menu making season around here and the emotional tide is running high. Since former seasons have caused such personal anguish (literal bloodshed, literal tears), I've officially handed the reigns back over to Michael, who is better at it anyway. While this stack of fresh menus would have taken me three weeks, a panic attack, and a host of eye rolls, he had it done in less than two hours! Imagine that. Now I have time to commit myself to other, more productive, things….like blogging. After many months of corresponding with our olive oil producer in Florence (and personally battling the cultural difference of email response times >_< ), our olive oil is finally here. It just goes to show, there's no length we won't go to for good olive oil. It simply makes the difference. Stop by to try it or purchase a can for yourself! I took a whack at Chef Michele's piattino di primizie (plate of spring) and consequently stumbled into nirvana. Lowering the boiling temperature used to be called cooking 'al fiasco’. Tuscan natives would combine all the ingredients inside a glass flask and nestle it within the warm ashes of a fireplace. They would leave it overnight to cook and by morning the beans were cooked perfectly and breakfast was ready. 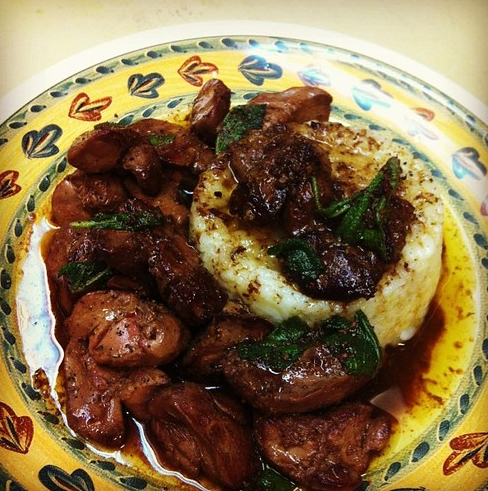 Double chicken livers for tonight's favorite customer! And this is how it ends! Grapes are in season, so why not put them in the pheasant terrine? Delish! Going to visit the famous area of Piemonte called “Le Langhe” has been a dream of mine for a while. When I heard that Enzo Boglietti was coming to visit us in Brooklyn to organize a tasting of his wines at Locanda, I thought: that’s it! November 24th was my birthday so I decided to give myself a trip to Italy. I wanted to not only see where Enzo was from and taste his wines, but also sample some of the local food so I could begin crafting the menu for our wine dinner. I organized a visit to Enzo’s winery with my uncle and brother, who live about 4 hours away in Florence. We arrived at noon on a beautiful sunny Friday. Enzo was there to welcome us and give us a tour of his estate. Enzo’s winery is located in the very heart of “Le Langhe”, the historic region between the provinces of Cuneo and Asti in the southern part of Piemonte, famous for its wines and white truffles. His vineyards are all over this area and the oldest, and most famous, are in the cities of Barolo and La Morra. After visiting a few of the vineyards, and touring his new central facility in La Morra, time had come to eat lunch! We went to a local restaurant called “Osteria More e Macine”. We started with a bottle of Arneis as the owner showed us the menu written on a blackboard. Arneis is an indigenous grape to Piemonte, and means “little rascal” because of how difficult it is to grow. Everything on the menu sounded so good, we decided to order all of the appetizers. The highlights where the “battuta di fassone” a Piedmontese beef tartare with just a touch of oil and salt, the “salsiccia di Bra”, a sausage made from Piedmontese beef, and a giant bowl of snails in a green sauce. At the third bottle of Barolo, we had finished the appetizers and were already stuffed. We were pleading with the owner to not bring out any more food. We needed to save room for the night’s dinner! The owner, while opening yet another bottle of Barolo, solved the situation saying: “Ok then, taglierini with truffles for everyone!” Taglierini is a traditional Piemontese egg pasta, a bit thinner than tagliatelle, served simply with butter and truffles, and I must say, truffles and Barolo work quite well together. Always saving room for desserts, we had the “bōnet”, a typical flan made with chocolate and ameretti cookies, and a hazelnut tart with zabaione cream. To top it all off, before we left we somehow finished three bottles of Moscato d’Asti “bollicine”, or as they say, little bubbles. I left the restaurant very happy and very satisfied, having had my first experience of Piemontese living. This is what I came here for! After lunch, we had a nice drive through vineyards and rows of hazelnut trees and in about half an hour we arrived in Alba, the truffle town. We checked into our hotel and the first thing that we noticed was the subtle smell of something very familiar. We looked outside our window and we were staring at the Ferrero’s factory. That smell was coming from tons and tons of Nutella! Hazelnut is another typical product of Piemonte, and the fruit of the trees we passed on our way to Alba are use to create their world famous gianduia. After a brief rest, we head off to dinner. The restaurant that the owner of “Osteria More e Macine” recommended is called “La Coccinella”, the Ladybug. It is a very elegant, yet cozy, place with a lighted fireplace and the intense aroma of truffles. The food is very good. The antipasti ranged from caramelized pumpkin with Castelmagno cheese gelato, to stuffed onions, to marinated trout. The pasta I had is called “plin”. It’s similar to the square shaped agnolotti, but its smaller and more rectangular. Basically, its a small ravioli, this one stuffed with roasted pork and tossed with a ragu of the roasted pig itself. I, of course, needed more truffles, so I also ordered a cheese fonduta with poached egg and white truffles. My favorite dessert was a very nice red wine poached pear served with zabaione cream. The next day, the weather was still amazing, so we decided to visit the part of Alba where the local farm markets are gathered. The products are beautiful and fresh and I want to buy everything. Among the vegetables in season where Topinamburs and cardoons that are used to dip in a very typical and creamy sauce called “bagna caôda” made with milk, garlic and anchovies! The cheeses where beautiful: “Testun”, “Toma”, “Castelmagno”, “Raschera”, “Robiola”, just to mention a few. There was a stand that featured small salami with different flavors like truffle, Barolo, wild boar and donkey! Hazelnuts, Gianduia chocolate and truffle completed the experience. It was almost time to head back home but first we went back to Enzo’s estate to sample some, actually almost all, of his wines. Some I was familiar with because we have them on our list at Locanda. Some are new to me, but all are delicious. On our way to Florence, we have yet another amazing lunch in a very remote place that my uncle knows because years ago had worked in the area. We had an incredible Vitello tonnato sandwich, home made salame, pancetta and cheeses to die for. The desserts were also really good. Bonnet and hazelnut tart. As they say: it is a hard job, but someone has to do it… And I did it! The food in Piemonte is amazing, the products are fresh and genuine and the wine delicious. I was definitely inspired and I look forward to Boglietti Wine Dinner on January 19th at Locanda Vini e Olii, where I will try to recreate some of the atmosphere of Le Langhe.